It is always amazes me how fast our summers go by. It seems like just yesterday that we were in Nicaragua working with Project WOO and The Rotary Club of Ventura to help build the Playa Gigante Community Health Center! For the last year, KIRF has partnered with WOO and Rotary to help make a community’s vision for a local health clinic and educational center a reality. Now that the health clinic and community center construction is underway, the residents of the village of El Gigante know that soon they will no longer have to travel long distances for emergency medical care or health services. This means a lot to people who don't have access to a car in an area without regular public transportation. The building is projected to be completed within the next 8 months. A significant portion of the funding for the health clinic project has come from local businesses in Nicaragua. These businesses are also committed to the sustainability of the project through financial commitments for its future operational costs. The community has hired a local contractor to build the clinic using as much environmentally compatible, local materials as possible. For instance, the walls will be made using earth bags. The earth bag construction technique uses natural soils from around the area to fill bags used for walls construction. When we were digging the footings for the retaining walls, we helped sift the larger rocks from the soil so the soil could be reused to fill the earth bags. Part of our work on this trip to Gigante was to purchase doors and windows for the health clinic. We negotiated window and door dimensions, product installation, costs, and warranty work with a local carpenter in Rivas. 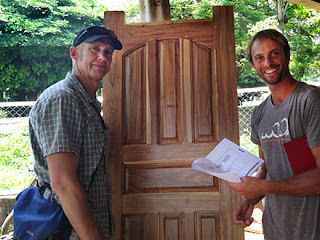 The carpenter told us that the wood he will use to build the windows and doors is called “laborel.” The laborel would is sourced from trees planted on a cacao plantation located near the border of Costa Rica. We also negotiated labor and steel costs with a local welder and artist named Kenny in Rivas to build aesthetic security bars for the windows to protect the supplies and equipment within the health center once it is completed. This is the same welder whom we had previously hired to build the health center’s huge well tower for the water tank. 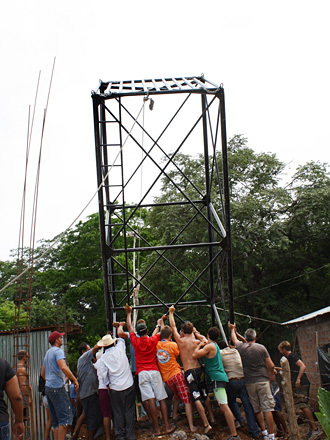 The well, well tower and tank were purchased during our last trip to Gigante in April of 2013. 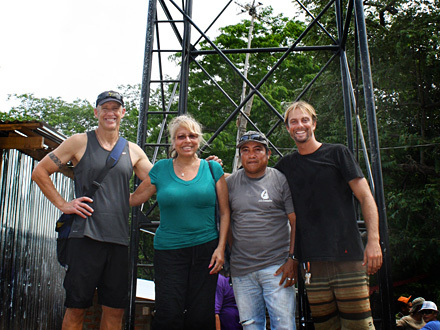 Under the project supervision of Project WOO’s Nicaragua Director, Bo Fox, the well was dug by local well expert, Ramon, and the tower was built by the Rivas welder, Kenny. During this last trip, we helped community volunteers to raise the well tower in its footings. The raising of the well tower was an exciting event with the town’s community leaders present. from the Gigante Community Health Center. KIRF and Rotary have always been supporters of clean drinking water. Having safe and clean water not only prevents gastro-intestinal illnesses, it indirectly protects against de-forestation since it does not have to be pasteurized (boiled) before drinking over a fire in households without electricity. The well was the first step in helping to provide clean, local water for the clinic. The well water will be filtered on site for easy access and safe drinking. Another step to preventing water-borne illnesses and obtaining clean water is proper sanitation. To that end, KIRF and Rotary purchased all of the sinks, toilets and plumbing for the health clinic. We also purchased a two-tank septic system for the clinic to protect the ground water from being contaminated. We are looking forward to returning to Gigante once the health clinic is finished to help provide medical equipment and supplies for it’s operational needs. Please let us know if you or your organization would like to help provide medical supplies for the Gigante Community Health Center: info@KIRFaid.org. Many thanks go to Bo Fox, fellow Rotarian Christina Rust, the Gigante Health Committee, and fellow KIRF volunteers Angela, Kai and Makani, and other volunteers who are helping with the project: the Rotary Club of Ventura, and the kind donors of KIRF who all helped make the Gigante Community Health Center a reality.